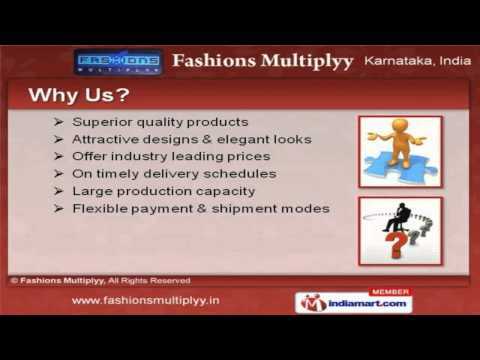 Welcome to Fashions Multiplyy, Manufacturer & Supplier of Menâs Apparels and Leather Products The company was incepted in 2011, at Bengaluru. International quality standards and Current market dynamics make us unique in the industry. We are well known for our Superior quality products, industry leading prices and on time delivery schedules We offer a wide assortment of Men&#039;s Shirts, Trousers and Jeans. Men&#039;s Belts, T-Shirts and Innerwear offered by us are in huge demand across the global markets. Our Leather Wallets, Men&#039;s Apparel and Colured Full Shirts are widely appreciated in the market. Kids Casual Shirts and Kids Denim Paints are reckoned all over the world for their superb quality. Our Men Formal Trousers for Office and Leather Wallets are setting a performance standard in the market. Party Wear Shirts for Wedding and Linen Pants are available with us at cost effective prices.